Following the first registered Yellow Fever case in December 2015, suffered by a citizen of Eritrea, who was visiting the district of Viana in the country’s capital, Luanda, Angola has been grappling with a yellow fever epidemic. Since then, the Angolan Ministry of Health says it has registered a total of 2,149 suspected cases with 277 deaths and 661 laboratory confirmed cases, 70 percent of which in Luanda. The worrying Yellow Fever outbreaks in Africa, specifically in Angola, have aggravated the international shortage of Yellow Fever vaccine. 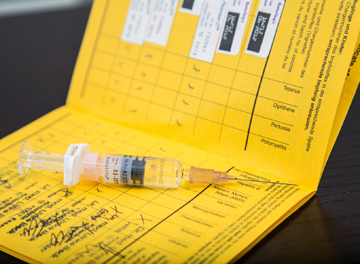 As announced by the Centers for Disease Control and Prevention (CDC) website, the manufacturer of yellow fever vaccine (YF-Vax), Sanofi Pasteur, has announced that supplies of all preparations of YF-Vax are limited, and ordering restrictions have been implemented. With a timeframe of 6 months to be produced, the replenishment of the Yellow Fever vaccine in the emergency stock piles of official organisations such as UNICEF, UN, WHO and CDC is a real challenge, exposing the world to a serious health risk and the possibility of a global health disaster. The Angolan Yellow Fever outbreaks have already reached its neighbouring countries in Africa, with staggering numbers in The Democratic Republic of Congo and a few cases in Kenya. In Asia, China’s government has already reported its first 11 cases of Yellow Fever. All those diagnosed had returned from Angola, home to an estimated 100,000 Chinese workers. The intense international trade and migration between Angola, Portugal, Brazil and China, means that the outreach of the disease beyond Africa is higher than ever before, which together with Yellow Fever vaccine global shortages, exposes the world global health to one of its most serious threats in many years. The CDC has raised Angola’s risk profile on Yellow Fever to “Alert – Level 2, Practice Enhanced Precautions” and adverts travellers to Angola aged 9 months or older be vaccinated against yellow fever. The government of Angola requires all travellers older than 9 months of age to show proof of yellow fever vaccination upon arrival, remembering that the vaccine should be taken 10 days before the trip. According to epidemic experts from the WHO, the vaccination campaigns have so far been effective, and Yellow Fever case numbers are dropping considerably, especially in Luanda. Yellow Fever is a disease caused by a virus, which is transmitted through mosquito bites, usually the Aedes aegypti mosquito, the same species that spreads the Zika virus and Dengue. Symptoms take from 3 to 6 days to manifest and include fever, chills and headache, back and muscle aches. In ab15% of people who develop Yellow Fever, the disease evolves into a more serious illness that can lead to bleeding, jaundice, kidney failure, shock, and sometimes death. According to recent studies, one dose of the vaccine suffices for a lifetime protection against Yellow Fever. Based upon this research, the WHO and CDC have adopted the recommendation to remove the 10-year booster dose requirement from the International Health Regulations (IHR), meaning that persons vaccinated once for Yellow Fever will probably not need a second dose, unless the person has a specific health condition or is exposed to specific risks. The CDC recommendation for travellers to countries with higher risk of Yellow Fever is to get the vaccine at least 10 days before the trip. For most travellers, one dose of the vaccine lasts for a lifetime. Always consult a travel medicine specialist to see if further doses are needed. In addition to the vaccine, avoiding the mosquito bite is the next most effective preventive measure against Yellow Fever. Be sure to cover exposed skin by wearing long-sleeved shirts and pants whenever possible, ALWAYS use insect repellents on all exposed skin, use permethrin-treated clothing and gear, stay and sleep in screened or air conditioned rooms and use a bed net if the area where you are sleeping is exposed to the outdoors.